game with the ECHL's Stockton Thunder. At age 20, Ryan O’Marra has been through quite a lot already in his career. He’s been a first-round draft pick. He’s been signed by the team that drafted him, the New York Islanders. He’s even been traded. Most recently, the two-way center was reassigned to the ECHL’s Stockton Thunder. O’Marra, who was dealt by the Islanders to the Edmonton Oilers in February as part of the Ryan Smyth deal, is looking at the move as a way to get his game on track. He scored twice in his first ECHL game, helping the Thunder earn a 4-0 win over the host Phoenix Roadrunners Oct. 24. The 15th overall pick in 2005 admitted the transition to Stockton wasn’t so difficult, given the relationship with some of his teammates from Edmonton’s training camp. Stockton coach Chris Cichocki has been handed the task by Oilers’ management to help O’Marra’s development. O’Marra played in only three games for AHL Springfield prior to his reassignment, watching five more from the press box. O’Marra said he wasn’t floored when told he was going to the ECHL. Instead, he is viewing the reassignment the same way as Cichocki. In the end, it’s a chance to get the playing time he needs to truly develop into the player the Oilers hope he is. O’Marra has been impressed with the talent he plays with or against on a nightly basis. Several of his teammates in Stockton are under contract with either Springfield or Edmonton. In 2006, some may have thought O’Marra was on the fast track to Long Island. After notching 77 points in 61 games for the Ontario Hockey League’s Erie Otters, O’Marra joined the Islanders’ AHL affiliate in Bridgeport. O’Marra made eight regular-season appearances for the Sound Tigers, tallying four goals and an assist. He also had an assist in three postseason contests. Just like he did during that stretch, O’Marra is confident that he can play at such a high level on a consistent basis. If he does that in Stockton, he could find himself back in Springfield sooner rather than later. 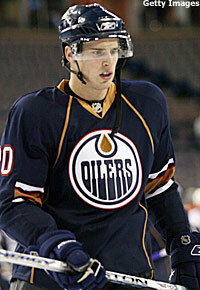 O’Marra admitted he was surprised when he got the call that he had been traded to the Oilers. Islanders GM Garth Snow shipped O’Marra and Robert Nilsson, as well as a first-round pick in 2007, to Edmonton in exchange for Smyth, who wound up signing with the Colorado Avalanche as a free agent less than five months after the deal went down. Now, O’Marra must work on becoming an excellent player in his own right. He knows he must work on every facet of his game if he hopes to one day land in the NHL. He also hopes his desire to win games will rub off on his teammates. Stockton has won just two of its first five contests this season. Cichocki is confident that if O’Marra does work hard and take advantage of the situation that’s been presented to him, then Stockton will merely be the first step on the road to the NHL. In essence, O’Marra is currently carrying the same burden as so many other players in the ECHL – trying to do enough to prove that he belongs at a higher level.